The teacher required to make a teaching plan (lesson plan) especially the detailed one before the teaching activity began that day. Also teacher have to prepare well all of materials needed for teaching, such as a power point for teaching or mathematics media. Student always ask to prepare their properseat before class begin. Then, students give a greeting to the teacher before the class start. Teacher checked their presence. 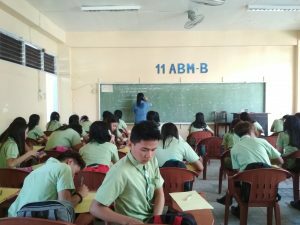 After that teacher open the class using apperception to review the last topic before teach the new topic and informed the students about the learning objectives. 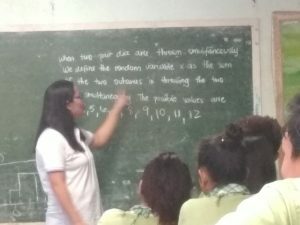 Afterwards, the teacher tried to relate the topic with the real world and motivates students to be interested in learning the new topic that the students will learn. Also teacher asked about topic matter before explain to know about students’ knowledge. And then the teacher explains about topic matter or materials for the day. 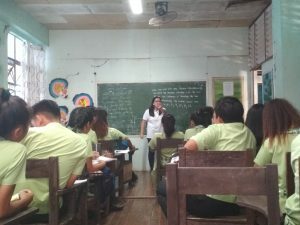 Teaching system was student-centered learning which teacher act as a facilitator to teach students and students will be able to explore and to build their knowledge. The teacher used expository method or discussion and discovery learning when she taught the students in the class. The teacher gave some explanation and mix it with games. Furthermore, teacher and students are active side each other. Teacher divide the students into 5 group and distributed the group activity worksheets to measurement and evaluation, student do the group acitivity worksheets in the group based on the topic of lesson that day. After student finished the group activity worksheets, teacher checked it together with the student. If the answer is correct teacher always give appreciation to them. And also, the teachers gives assigment in the end of the lesson on the day. The teacher should gives examination for the students in the end of the topic.